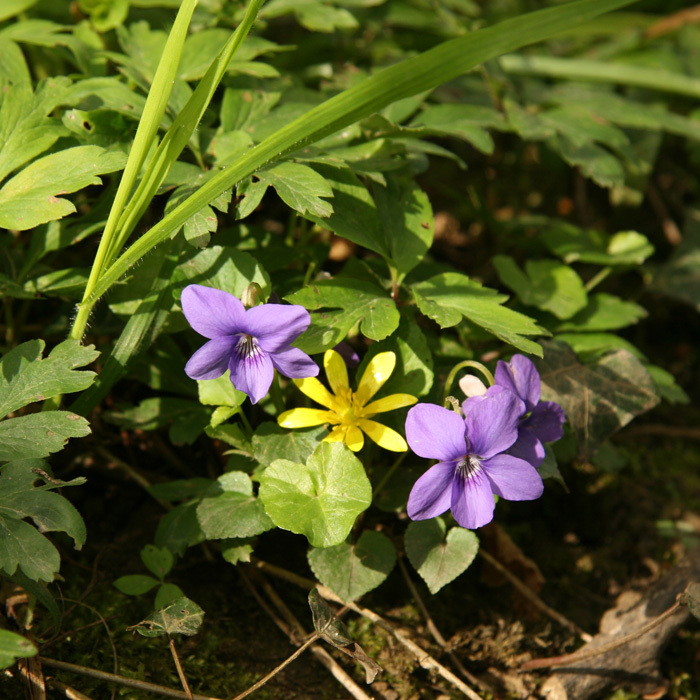 We would be packed into the car with our cousins and taken to the “secret woods” where you could stand ankle deep in violets. Which, strangely, Nana would never let us pick though she wasn’t adverse to setting us as lookouts while she helped herself to fuchsia cuttings from the village show. After Nana died we could never find the woods again, we probably spent too much time squabbling in the back of the car to remember where we were going but we can still stand ankle deep in violets. 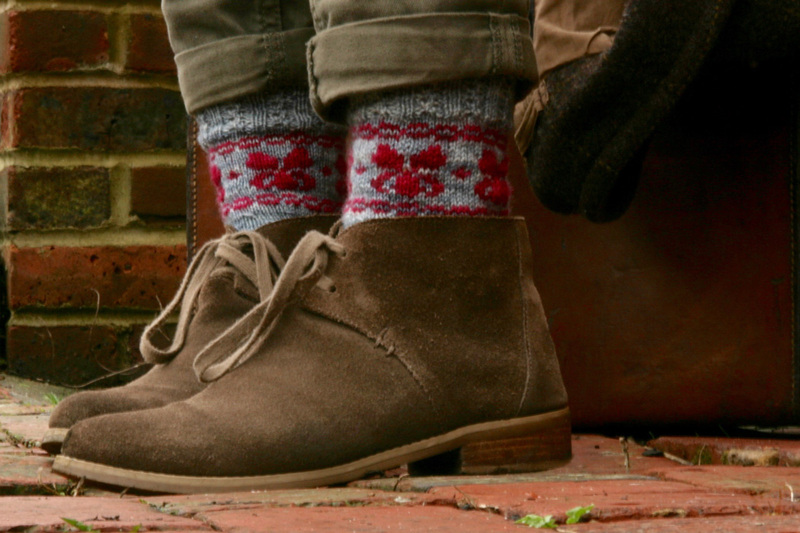 We have Selborne socks with a ring of colour-work flowers around the cuff. 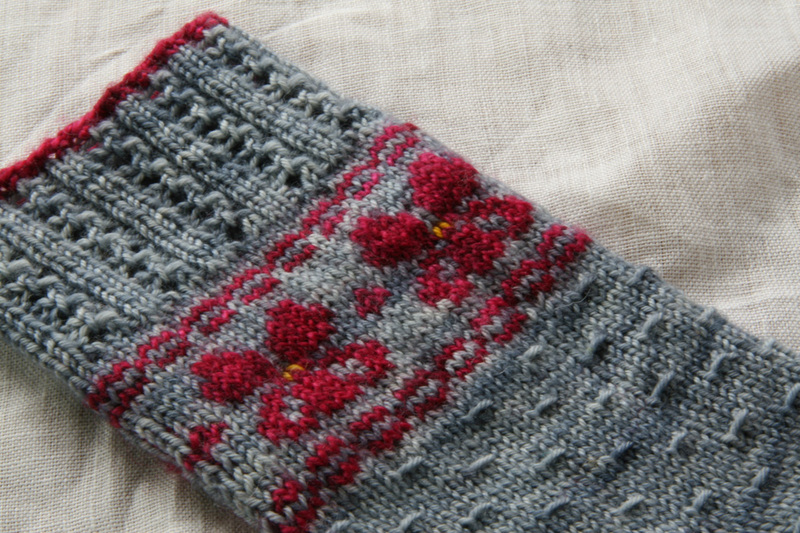 The socks are knit from the top down starting with a row of contrast colour and then a surprisingly stretchy lace rib cuff. There’s a panel of charted colour-work where the eye of the violets can either be worked at the same time or swiss darned on afterwards. If you chose to Swiss darn the centre it’s best to do each one individually as running the yarn around the back can make it too tight to get your foot in and try to keep the floats loose when you knit the colour-work. The leg and instep of the sock are knitted in a simple wrap stitch to give a little bit of texture and to keep your interest and there’s a slip stitch heel and rounded toe in the contrast colour. If you don’t fancy the heel or toe they can easily be swapped for your favourites and if you haven’t enough contrast yarn then same colour heels and toes would look good. Medium ladies foot 23cm / 9” in circumference. CC2: Yolk, only a short length is required so use up your scraps. 1 set 2.25mm / US1 double-pointed needles, or size needed to obtain correct tension. Colour-work pattern: 32 sts x 40 rounds = 10 cm/4in after blocking. Wrap stitch pattern: 36 sts x 46 rounds = 10 cm / 4 in after blocking. m1: Make one stitch – pick up strand between the two needles from front to back with the tip of the left needle, knit into the back of the loop. knit 2. This makes a yarn over. With the point of the left hand needle lift the yarn over, over the two knit stitches. yfrn: Yarn forward round needle. Round 4: K1, *W2sts, k4; rep from * to last 5 sts, W2sts, k3. Rounds 5 – 7: Rep rounds 1-3. Round 8: *K4, W2sts; rep from * to end of round. Using CC1 and the long tail method cast on 60 sts. Arrange stitches as follows over three needles. Join to work in the round being careful not to twist the sts. Place marker for start of round. Round 1: *K2, p1; rep from * to end of round. Round 2: *k2, p1, k2tog, yfrn, p1; rep from *to end of round. Round 3: *k2, p1; rep from * to end of round. Round 4: *k2, p1 yo, k2tog tbl, p1; rep from * to end of round. Continue in the lace ribbing pattern working a total of 6 full pattern repeats. (24 rows). 64 sts. The Square marked with ‘X’ is Swiss Darned after completing the sock. Continuing with the wrap patt work a further 17 rounds or until the desired length is reached ending on round 1 or 5. Set up: K 15, sl the rem sts from needle 1 to needle 2. Turn the work so the WS is facing. Next row (WS): Change to CC1, sl1, p29. The heel flap is worked back and forth on these 30 sts. Keep the remaining 30 sts on the second needle for the instep. Row 1 (RS): *Sl1, k1; rep from * to end. Repeat these two rows 14 more times, a total of 31 rows in CC1 ending with a WS row. Row 1(RS): Sl1, k16, ssk, k1, turn. Row 3: Sl1, k to 1 st before gap, ssk (closing the gap), k1, turn. Row 4: Sl1, p to 1 st before gap, p2 tog, p1, turn. Rep rows 3 and 4 until all sts have been worked 18 heel sts remain. Set up round: K9, pm for start of round, k9, pick up and knit 16 sts along the side of the heel flap, one st for each of the slipped stitches. Change needle and work the 30 instep sts starting with texture pattern row 2 (a knit row). Change needle, pick up and knit 16sts along the side of the heel flap, k to marker. The start of the round is now in the middle of the heel sts. (80 sts). Round 1: K to last 3 sts on 1st needle, k2tog, k1, work in pattern as established over 30 instep sts, k1, ssk, k to end of round. Round 2: K sts on 1st needle, work in pattern over instep sts, k sts on 3rd needle. Rep these 2 rounds a further 9 times. (60 sts). 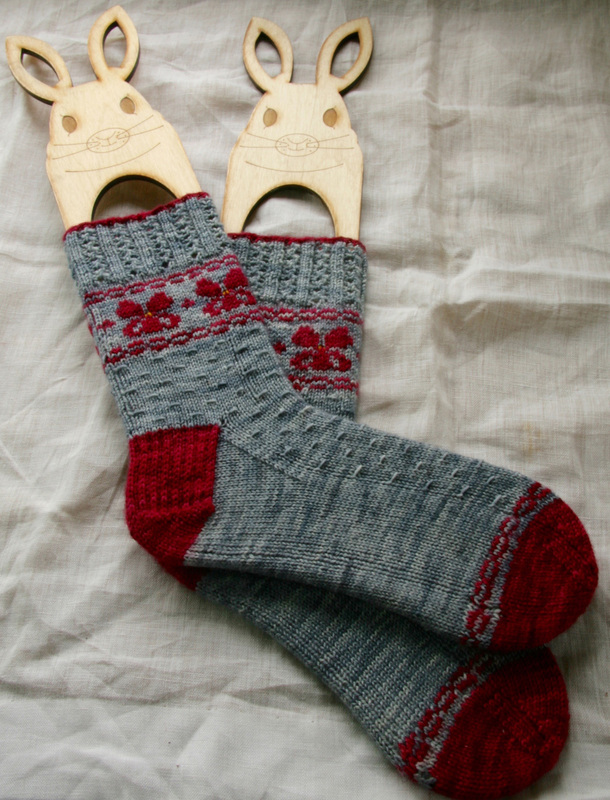 Continue in patt as established until the sock measures 7 cm / 2 ¾ in less than the desires foot length ending with round 3 or 7 of the Wrap Stitch patt. Reading from right to left, work the 3 row chart repeating the 4 st motif 15 times over the 60 sts. Next: K 2 rounds in MC. The toe is worked using CC1. Decrease round: K to last 3 sts on 1st needle, k2tog, k1; k1, ssk, k to last 3 sts on 2nd needle, k2tog, k1; k1,ssk, k to end. (56 sts). Rep the decrease round. (52 sts). Rep the decrease round. (48 sts). Rep the decrease round. (44 sts). Rep the decrease round. (40 sts). Rep the decrease round. (36 sts). Rep the decrease round 4 more times. (20 sts). Next round: K the 5 sts from 1st needle. Graft the toe stitches together with Kitchener Stitch, a very good tutorial can be found here. Sew in all ends. 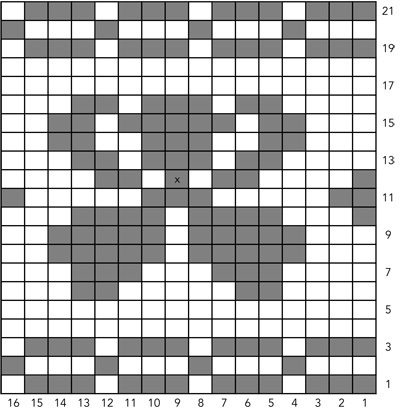 The centre stitch of the viola marked X in the chart is Swiss Darned using duplicate stitch and CC2. Try to darn each flower centre individually rather than working with a float as there is very little stretch when putting on the sock. Wet block to shape and leave until dry. NB: If you downloaded the pattern in the first few days the number of rows of wrap stitch pattern for the leg was wrong. This has now been amended in the PDFs. Sorry for this, my sister and I are still squabbling about who’s fault it was, just as we used to in the back of Nana’s car. Thank you so much for this beautiful pattern! I can’t wait to cast on! When I saw it on Ravelry, I clicked on it to see how much it was, and couldn’t believe it was free. Thank you! Thank you so much for a beautiful pattern. I couldn’t believe it when this came up on Ravelry-I drive through Selborne everyday on my way to work , we live in Alton just up the road from there! It’s a very beautiful part of the country but when I went back to the zig-zag hill it was so much smaller than I remember and it’s not as if I’ve grown any taller. If you want to have a look at the socks and you’re going to Unravel in Farnham at the weekend we’ll be taking them along. A really lovely design I’m could return to again and again. Thank you for your generosity in sharing your work in this way.